Beech or Fagus are a small genus containing some of the most noble trees that can make a fine specimen tree. 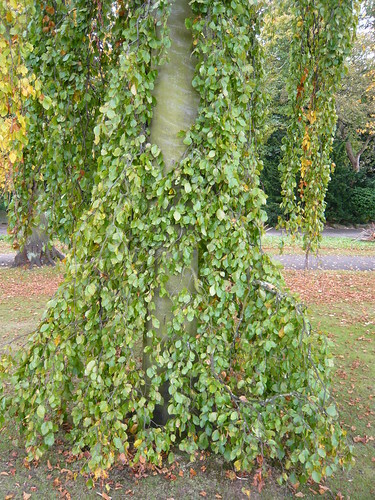 This weeping Beech’s full name is Fagus Sylvatica Pendula or the Weeping Beech although I have christened in the Crying Beech. It is a large and spectacular form with the main stem or trunk covered in droopy hanging branch lets. There are several related weeper but this tree was quite singular in it’s habit and grew to 50 feet yet still looked immature. Fagus sylvatica ‘Purple Fountain’ as an excellent tree with cascading branches and dark, bronze/purple/green foliage. Very similar to other weeping beech but much more columnar in shape. Leaves turn more green throughout the summer. 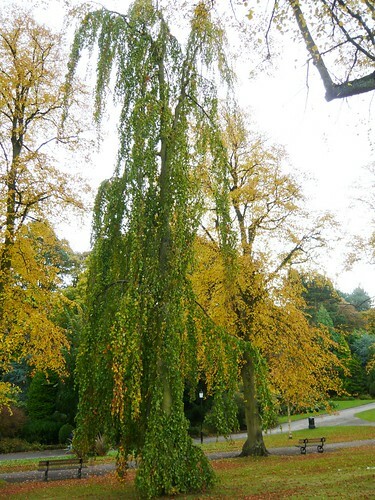 Beech in Autumn at Valley Gardens Yorkshire. Amazon supply Beech trees and Purple Beech. but a nursery would have a wider selection.